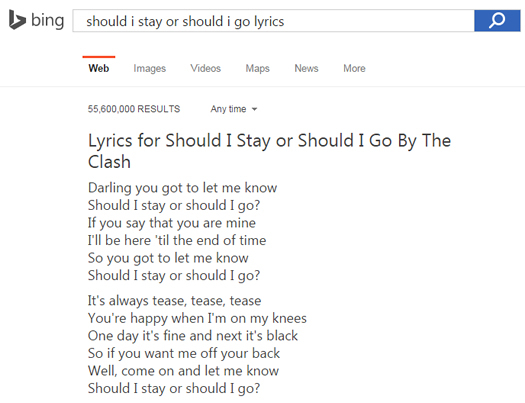 Summary: In the fall of 2014, both Bing and Google began surfacing song lyrics directly in the search engine results pages (SERPS). Since users could now find lyrics immediately in the SERPs, many wondered what would happen to lyrics websites that provided the same information, but required a click through to view the lyrics. This post provides findings from analyzing three large-scale lyrics web sites to determine the traffic impact of lyrics in the SERPs. What Could Lyrics Web Sites Do? In April of 2014, I picked up a major algorithm update that heavily impacted lyrics web sites. The drop in traffic to many key players in the niche was substantial, with some losing 60%+ of their Google organic traffic overnight. For those of you familiar with Panda or Penguin hits, you know what this looks like. I ended up digging in heavily and analyzing the drop across the entire niche. I reviewed a number of lyrics sites across several countries that got hit and wrote a post covering my findings (linked to above). After writing that post, I had a number of lyrics sites reach out to me for more information. They wanted to know more about what I surfaced, what the problems could be, and if I could help rectify the situation. It was a fascinating algo hit to analyze and I absolutely wanted to take on the challenge of helping the sites recover. So I began helping several of the lyrics sites that were heavily impacted. I took on several of the lyrics sites as clients and began heavily analyzing and auditing the negative impact. That included performing a deep crawl analysis of each site, a heavy-duty technical SEO analysis, a thorough content analysis, while also using every tool in my arsenal to surface SEO-related problems. I won’t sugarcoat my findings, there were many problems I surfaced, across content, technical SEO, and even links (in certain situations). It was hard to say if the specific update in April was Panda, a separate algo update that hammered lyrics sites, or something else. But I tackled the situation by covering as many bases as I could. Each remediation plan was extensive and covered many ways to tackle the problems I surfaced. As time went on, and many changes were implemented, the sites started to recover. Some recovered sooner than others, while other sites took many more months to surge back. On that note, many of the large lyrics sites have ridden the Panda roller coaster for a long time. And that’s common for large-scale websites that haven’t focused on Panda-proofing their web sites. Over time, insidious thin content builds on the site like a giant layer of bamboo. And as the bamboo thickens, Panda smells dinner. And before you know it, boom, Panda hits the site (and for these sites, it hit them hard). After recovering, each site would hold their collective breath while subsequent Panda updates rolled out. Based on the lyrics web sites I have assisted, only one has fallen again to Panda. The others have remained out of the gray area and are doing well traffic-wise. Unfortunately, one lyrics web site I was helping saw a temporary recovery after recovering relatively quickly (almost too quickly). Quick recoveries are rare when you’re dealing with Panda, so I did find that specific recovery odd. It typically takes months before you see a major surge after being pummeled by Panda. The site surged during the 9/5 update and then got hammered again during the cloaked 10/24 update. And Panda has not rolled out since 10/24/14, so we’re still waiting to see if the site comes back. But enough about Panda for now. Actually, Google Panda could pale in comparison to what showed up in late fall 2014. We all knew it was possible, considering Google’s ambition to provide more and more data in the search engine results pages (SERPs). But it’s another story when you actually see it happen. I’m referring to the search engines adding lyrics directly in the SERPs. You know, when someone searches for song lyrics, and boom, the lyrics show up right in the desktop or mobile SERPs. No click through needed. I’ll cover how this unfolded next. Bing was the first to add lyrics in the SERPs on October 7, 2014. That was the first bomb dropped on lyrics sites. It was a small bomb, considering it was only showing in Bing in the United States and Bing has approximately 19.7% market share (according to comScore Dec 2014 stats). Bing also drives Yahoo search (organic and paid), but lyrics are not showing in Yahoo yet. But the writing was on the wall. Lyrics were coming to Google, and sooner than later. When lyrics hit Bing, I sent emails to all of my lyrics clients explaining the situation, providing screenshots, and sample searches. Not every song would yield lyrics in the SERPs, but this was still a major event for the lyrics industry. Next up was the first move by Google. On October 24, 2014, if you searched for a specific song, Google began providing a YouTube video with some song and artist information at the top of the SERPs. And near the bottom of that unit was a line or two from the lyrics and then a link to Google Play for the full lyrics. 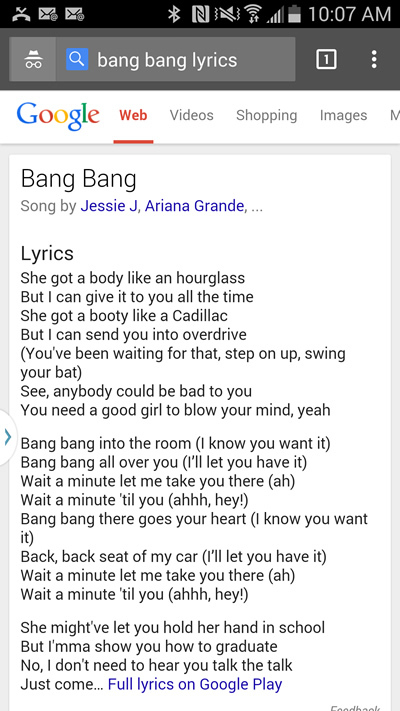 Whoa, so Google was beginning their assault on lyrics by simply linking to Google Play to view the lyrics. Again, I immediately emailed my clients and explained the situation, knowing lyrics were coming to the main SERPs soon. 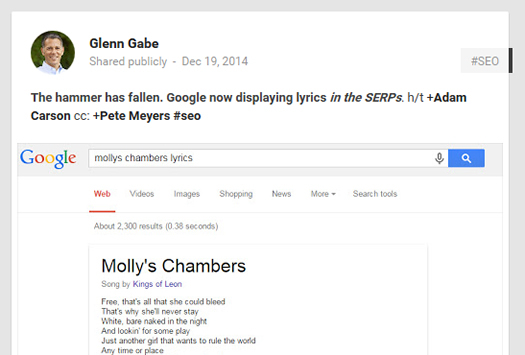 I shared this screenshot of Google including lyrics directly in the SERPs, and the G+ post got noticed, a lot. That share was mentioned on a number of prominent websites, including Search Engine Roundtable, TechCrunch, Billboard, and more. To clarify what was happening search-wise, on December 19, 2014 Google began showing song lyrics for users in the United States, and only for certain songs. I’m assuming the limit on songs and geography was based on licensing, so this doesn’t impact every song available. I’ll cover more about the impact of those limitations soon when I dig into some stats, but it’s an important note. 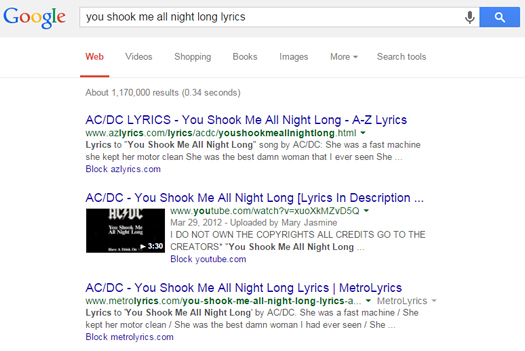 But if you search for “you shook me all night long lyrics”, you won’t see lyrics in the SERPs. 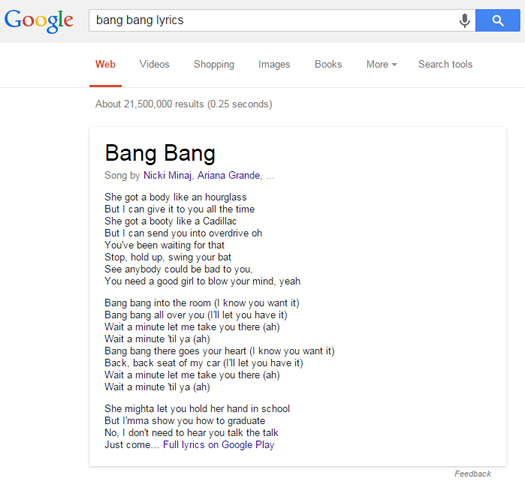 Clearly Google doesn’t have the rights to present the lyrics to all AC/DC songs, but it does for “Bang Bang”. And by the way, that’s for the desktop search results. This is also happening in mobile search, in the United States, and for certain songs. Talk about dominating the mobile SERPs, check out the screenshot below. Where on desktop, you get the lyrics, but still see links to lyrics websites above the fold (typically), mobile is another story. Can you see the massive difference? It’s just lyrics, and nothing else. And to add insult to injury, the percentage of users searching for lyrics is heavily skewed mobile. And that makes sense. Those users are on the go, hear a song, want to know the lyrics, and simply search on their phones. Or, they are in a situation where their phone –is their computer– so their searches will always be mobile. Based on what I’ve explained so far, you know that Panda loves taking a bite out of lyrics web sites and you also know that both Google and Bing are providing lyrics directly in the SERPs (in the US and for certain songs). And you might guess that all of this means absolute death for lyrics websites. But wait, does it? I wouldn’t jump to conclusions just yet. There are definitely nuances to this situation that require further analysis and exploration. For example, how much of a hit have the lyrics sites taken based on lyrics in the SERPs? How much traffic dropped for each song that yields lyrics in the SERPs? Was there an impact just in the United States or around the world too? And what about the difference between desktop and mobile? All of these were great questions, and I was eager to find answers. So, I reached out to several of my lyrics clients and asked if I could analyze the changes and document the data in this post (anonymously of course). The post isn’t meant to focus on the sites in particular, but instead, focus on the impact that “lyrics in the SERPs” have made to their traffic. The lyrics websites I’ve been helping generate revenue via advertising, so a massive drop in traffic means a massive drop in revenue. It’s pretty much that simple at this point. That’s why Panda strikes fear in every lyrics web site owner and why lyrics in the SERPs can strip away visits, pageviews, and ad dollars. It’s a new one-two punch from Google. Three of my clients were nice enough to let me move forward with the analysis. And I greatly appreciate having clients that are awesome, and are willing to let me analyze and share that data. The three sites I analyzed for this post are large-scale lyrics sites. Combined, they drive more than 30 million visits from Google organic per month and have approximately 6 million lyrics pages indexed. And as I explained earlier, a lot of that traffic is from users on mobile devices. Approximately 40-50% of all Google organic traffic is from mobile devices (across all three sites). My goal with the analysis was to understand the impact of lyrics in the SERPs from a click-through and traffic standpoint. I dug into search queries driving traffic over time to all three sites while also checking impressions and clicks in the SERPs (via Google Webmaster Tools, both desktop and mobile). Then I also checked Google Analytics to determine the change in traffic levels to song pages since the lyrics hit the SERPs. For example, if a query saw a similar number of impressions since the launch of lyrics in the SERPs, but clicks dropped off a cliff, then I could dig in to analyze the SERPs for that query (both desktop and mobile). I found some interesting examples for sure, which I’ll cover below. My analysis measured the impact right after lyrics hit the SERPs (from December 19, 2014 through the end of January 2015). The holidays were mixed in, which I tried to account for the best I could. Some of the lyrics sites saw steady traffic during the holidays, while one dipped and then returned as the New Year approached. The songs I analyzed and documented were not holiday-focused songs. I made sure to try and isolate songs that would not be impacted by the holidays. Also, Google Webmaster Tools data was sometimes wonky. I’m sure that’s no surprise to many of you working heavily in SEO, but it’s worth noting. I tried my best to exclude songs where the data looked strange. When I began my analysis, I quickly found out that the straight reporting in both Google Webmaster Tools and Google Analytics wouldn’t suffice. Overall Google organic traffic wouldn’t help, since lyrics only rolled out in the SERPs in the United States. When checking traffic since the rollout, you really couldn’t see much overall change. But the devil is in the details as they say. So I used the functionality available to me in both GWT and GA to slice and dice the data. And that greatly helped me understand the impact of lyrics in the SERPs. 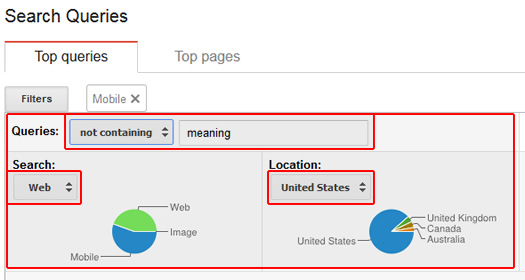 In Google Webmaster Tools, the search queries reporting enables you to filter the results. This was incredibly helpful, as I was able to isolate traffic from the United States and also view web versus mobile traffic. But there was another nifty filter I used that really helped. You see, many people visit lyrics websites for the meaning of the lyrics, and not just to see the lyrics. For example, “take me to church meaning” or “meaning of hallelujah lyrics”. The reason I wanted to weed those queries out is because as of now, Google does not provide the lyrics in the SERPs for “meaning” focused queries. And that’s good for my clients by the way. So by adding the filters per site, I would able to isolate songs that could be impacted. After setting the filters, I was able to search for queries that yielded relatively stable impressions, but saw a drop in clicks and click through rate. And I always kept an eye on average position to make sure it didn’t drop heavily. From a Google Analytics standpoint, I ran into a similar problem. Top-level statistics wouldn’t cut it. I needed Google organic traffic from the United States only. And then I wanted both Desktop and Mobile Google organic traffic from the United States only (separated). That’s where the power of advanced segments come in. 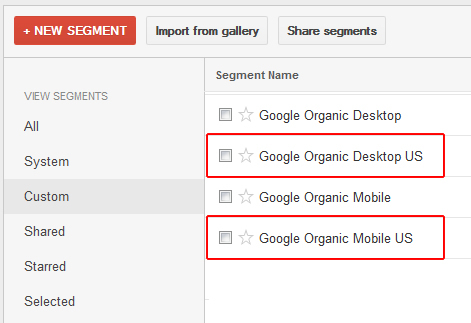 I built segments for Desktop Google organic traffic from the United States and Mobile Google organic traffic from the United States. By activating these segments, my reporting isolated that traffic and enabled me identify trends and changes based on those segments alone. 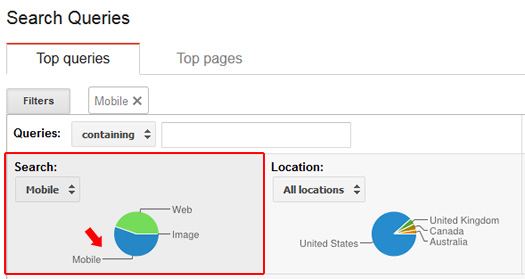 By the way, I wrote a tutorial for how to use segments to analyze Panda hits. You should check that out if you aren’t familiar with segments in GA. You’ll love them, believe me. So, with the right tools and filters in place, I began to dig in. It was fascinating to analyze the queries leading to all three sites now that lyrics hit the SERPs. I cover what I found next. By the way, this posts focuses on Google and not Bing. I might write up another post focused on Bing’s lyrics in the SERPs, but I wanted to focus on Google to start. As you can see from the statistics above, both desktop and mobile traffic to the song pages dropped significantly since lyrics hit the SERPs (for songs that yield lyrics in the SERPs). Again, these songs showed stable impressions during the timeframe, yet showed large drops in clicks from the SERPs, and subsequent traffic to the three lyrics sites I analyzed. 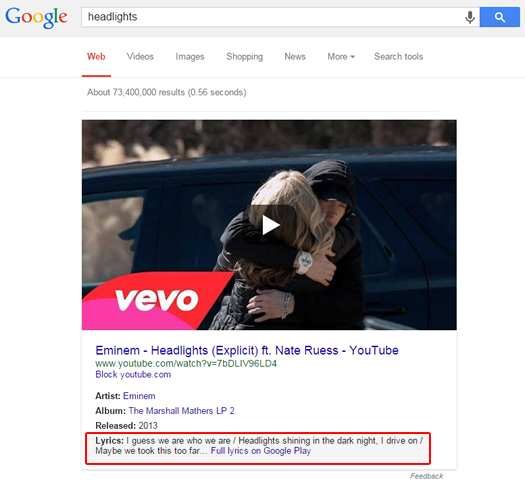 Some users were clearly getting what they wanted when searching for lyrics and finding that information in the SERPs. And in mobile search, the lyrics take up the entire results page. So it’s no surprise to see some mobile numbers absolutely plummet after lyrics hit the SERPs. What Could Lyrics Sites Do? Above, I provided a sampling of what I saw while analyzing the impact of lyrics in the U.S. Google SERPS. Clearly there’s a large impact. 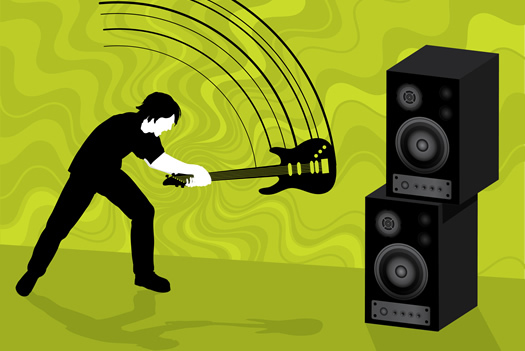 The good news for lyrics sites is that there are several core factors helping them right now. This is only in the United States. Not all songs are impacted (yet). I found many examples of songs that did not yield lyrics in the SERPs. Again, this is probably due to licensing issues. If you look at the overall traffic numbers for the sites I analyzed (and the other sites I have access to), Google organic traffic overall has not been heavily impacted. Taking all global Google organic traffic into account, and across all songs, you clearly don’t see the huge drop like I showed you for the songs listed above. That said, this is still a grave situation for many lyrics sites. The content they have licensed and provided on their sites is now being surfaced directly in the SERPs. If this expands to more songs, more countries, and for additional queries, then it can have a massive impact on their businesses. Actually, it could very well end their businesses. Moving forward, lyrics sites need to up their game from a functionality and value proposition standpoint. If Google can easily add lyrics to the SERPs, then lyrics sites need to keep driving forward with what Google can’t do (at least for now). They should develop new functionality, strengthen community engagement, provide member benefits, include more data and media for artists and songs, provide a killer mobile experience, etc. Remember, there are many people searching for additional information related to songs. For example, people want to know the meaning of lyrics and seem to enjoy the community engagement about learning what each lyric means. 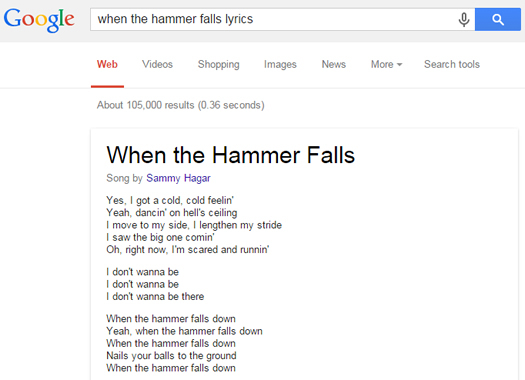 And lyrics don’t trigger in the SERPs for those queries (yet). And then you have the next generation of devices, social networks, messaging apps, gaming consoles, connected cars, etc. I would start thinking about how people are going to search for lyrics across new devices and in new environments. That’s a new frontier and it would be smart to begin building and testing lyrics applications that can work in those new environments. Mobile, wearables, voice search, cars, etc. provide a wealth of opportunity for business owners focused on music. It just takes the right ideas, time, resources, and of course, money. In the short-term, it’s hard to say how this will expand. Google and Bing might drop the effort and keep things as-is, or they could keep expanding lyrics in the SERPs until every song and every country is covered. Based on the current song and geography limits in Google and Bing, lyrics websites are still surviving, and especially for searches outside the United States. It will be interesting to watch this space over time, especially since I have several clients adapting to the new lyrics world as I write this post. From an SEO standpoint, between Google Panda and content surfacing in the SERPs, lyrics web sites are fighting a battle on two fronts. If it’s not Panda attacking the site one night, it’s the Knowledge Graph pushing song lyrics front and center in the SERPs. And in this day and age, wars are won by technology, not brute strength. So lyrics sites need to up their engineering prowess, think two to three steps ahead of the industry, and then execute quickly and at a very high level. That’s how they can survive and prosper in the coming years. Of course, that’s until we have a Google chip implanted in our brains that instantly provides the lyrics to every song ever written, from the around the world, since the beginning of time. Think about that for a second.